This recipe is similar to the mango rice/mavinakayi chitranna which is rice based dish most commonly prepared in south india. Chitranna/yellow rice is prepared by initial seasoning followed by sauting of onion and grated raw mango scrapes. 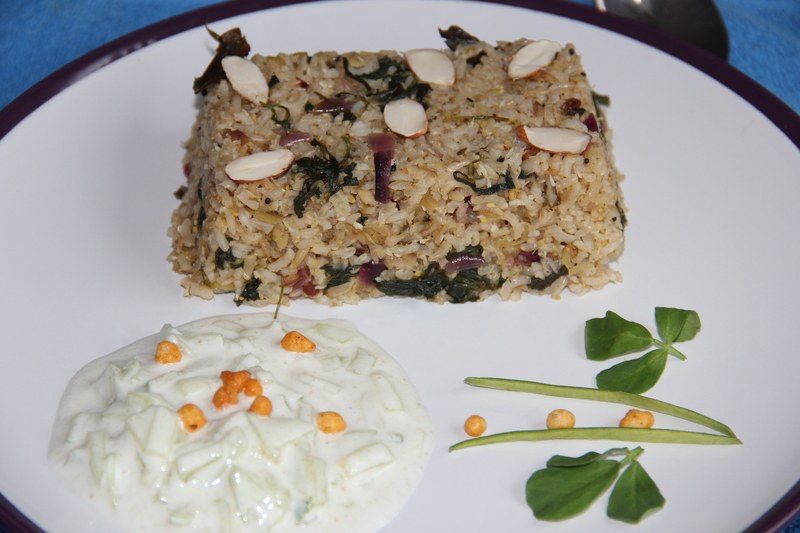 Here the variation is I have used brown rice to add the fiber to the dish and fenugreek/methi leaves. Because of its bitter taste many prefer to avoid eating fenugreek so add fresh leaves to food like dals, rice, curries and parathas to consume it healthy. Green mango is full of vitamin c, and they are great for warding off anemia and for increasing the integrity of blood vessels. It is good for the liver helping to increase the secretion of bile acids and cleans the intestines of bacterial infections. Posted on June 26, 2014, in Indian, Main dish and tagged Brown rice recipes, Chitras healthy kitchen, drchdietfood, Healthy yellow rice, Methi rice, Raw mango recipe. Bookmark the permalink. 9 Comments. I am loving the combinations you have created….. Tangy mango with bitter methi. Cannot wait to try this. Hi Chitra, Love this mango rice dish. I wanted to let you know that I nominated you for the Team readership award – http://wp.me/p3Nc97-vT. Have a lovely day!